How will computer and network automation and orchestration help transform your organization? We need only look to the history books to see a real-world example of an assembly line to give us a good concrete model for thinking about automation and orchestration. We will use this model in the context of modern computing, networking and business logic to discuss the advantages for your organization. The first assembly lines were simplistic, they used common components installed by laborers who specialized on performing one task. The benefits were reduced cost, higher quality and increased productivity / profitability. As technology progressed manufacturers incorporated systems of robots that worked together to build very high quality and low-cost products. Each robot, like a human, specialized on performing one task. We can see from the mid-1900s photo on the left an early example of an operational framework: the people that work on the assembly line and install the components. This human framework was not automated. It was prone to error, it was only operational part of the time (subtracting nighttime, weekends and holidays) and used a clumsy imprecise verbal language as a method of orchestrating tasks. The chance for ambiguity could introduce misunderstandings among the employees resulting in inefficiencies. As time progressed, industry replaced the humans with machines that worked every minute of every day, took no time off and did exactly as they were instructed. This is automation. These robots have a high-speed API that is well defined and error free without any misunderstandings allowing them to work together. This is orchestration. The same evolution is happening today in computing and high-speed networks. Most networks are in the early manual assembly line stage of evolution: a team of operators that manually execute tasks. The remainder of this article will discuss why investing in automation and orchestration can help your organization reduce costs while increasing productivity. The first lesson the assembly line teaches us is that common components reduce overall cost. The ability to have reusable parts lowered the cost to clone those parts and use them for both production, repair and in other similar products. Once a part was well defined it was easy to find cheaper labor that could be trained to manufacture and maintain these common parts. This stage can be characterized in modern computer networking parlance as an operator who manually runs scripts to perform tasks that enable business goals. While there is an advantage, it is not the most efficient mode of operation. Each script assumes its own custom API. A common API is key for reuse. The second lesson that we learn from assembly lines is that automation is a time-tested and effective tool for reducing cost. This is accomplished by: reducing the amount of time to produce a product, to reconfigure to mitigate a failure, to build a new product, or to change a business process. Having custom components that could be installed in our products allowed us to have quality assurance in that if a part was not up to spec it could be swapped out for one that was in spec. The net effect was that the product that was assembled was of superior quality than one that was hand made by a single worker. Today most organizations use scripts to perform functions on the individual components. Building a system of orchestrated scripts requires some type of framework. Investing in building the framework can be a costly and daunting process as we can see in the investment required to replace the human workforce with a fully automated robotic workforce. Implementing the framework incorrectly can be very costly if not fatal to your organization. What if you could leverage a pre-made framework and get that expensive assembly line for a small cost? You can with Extreme Workflow Composer. The Workflow Composer based upon the opensource Stackstorm project is a premade event driven framework that includes the common components used to control many popular products shown in the graphic below in blue boxes. Leveraging workflow composer your business will get most of the assembly line instantly. Specific items that are your unique value add can be easily added to the Workflow Composer enabling your organization to leverage the enormous investment that has been made by both the open source Stackstorm community and by Brocade and now Extreme Networks. Technology enables your organization, but sometimes it feels like the technology itself is getting in the way. This is the same growing pain that the assembly line experienced when transitioning from human labor to robotic labor. It took time for the humans to recognize a problem had occurred and to take the appropriate actions to remediate. With organizations estimating the cost of network outages in units of millions of dollars per minute, the adage ‘time is money’ is truer today than ever and it is imperative to have a robust network. Decreasing the amount of time to produce a product while also increasing the overall system availability has the net effect of increasing the productivity of your organization. The assembly line solved this problem with high speed APIs that controlled the assembly line robots. Organizations use workflows to automate between functional silos; storage, networking, app development, etc. Making the organization more agile. The investment in robotic assembly lines was complex and took time and money to get right. 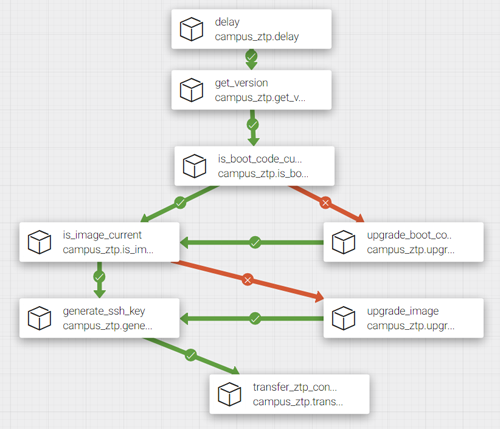 The Workflow Composer bootstraps your journey to automation and orchestration by leveraging the workflow framework and allows you to integrate it with existing systems and processes. Chances are that your organization has legacy systems and processes that will require some type of integration. The legacy systems support some type of API; REST, SSH, Telnet, SNMP, Openflow, etc., the list is too long to enumerate. The Workflow Composer supports (or can support) any API. This flexibility is due to its modular and extensible nature via ‘packs’. A pack is a bundle of scripts and executables that are described by a simple YAML file which contains meta information about your scripts and executables and their arguments and options. You can write your own packs based upon the scripts and executables that you have already invested in or use existing packs. The Workflow Composer uses the meta data to understand exactly how to use each feature of a script to ensure that each action is successful. One way to think of the meta data is to picture it as the conveyor part of the assembly line. The architecture of our framework is shown above; it is the assembly line. The assembly line is event driven. For example, a car enters the line which triggers a rule “paint car”. The work flow specifies the color of the paint and the order that the components get painted. The action is the control data sent to the robot that does the painting. A sensor could be just about anything that we want to start a chain of events. An example could be to sense when a drive is almost full and free up hard disc space. The work flow might be to back up important files and off load them to an archive to free the space. A sensor could be local or remote and access the REST API of Workflow Composer. We call this a ‘web hook’. The web hook is defined by a rule which setups the REST API. Data sent to that REST API in JSON format is automatically injected to the workflow. Workflow logic can then be applied to perform one or more actions. Workflow Composer provides a simple to use graphical way to define workflows; drag an action from one of the ‘packs’ on to the canvas and connect that block by point and click. Constructing and maintaining a workflow is quick and easy because they are self-documenting. This is important when you need to make changes to your processes as your organization’s needs change. The workflow shown below is an example of zero touch provisioning that is triggered when a factory default switch is booted. The firmware and boot code versions are compared to the latest version and updated if needed. Next SSH keys are generated and installed. Finally, the switch is configured and rebooted with the new configuration. Another example of interfacing to a legacy hardware based system is shown in a Laser tag demonstration. The Laser tag gun is the legacy system. In this demonstration, a Laser tag ‘hit’ onto an Internet of Things (IoT) sensor is used to trigger a workflow. The workflow reconfigures a switch trunk port and VLANs to allow IP multicast video to flow from a source to a receiver for 60 seconds. When the 60 second timer expires, the VLANs are deleted from the trunk and the video stops. Watch the video of the Laser Tag demo in action, here! 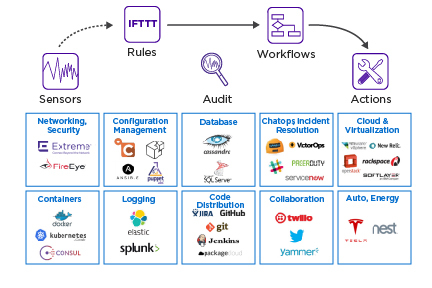 In addition to the automation and orchestration, Workflow Composer keeps a history of every workflow that was run and the results of each action. This is a great utility for forensics and trouble shooting and extends visibility into the realm of cyber security. Most organizations are becoming very aware of how their security posture must change to keep up with the increased threats. Security is becoming embedded in all aspects of an organization. Imagine that your automation and orchestration is coupled with your security tools. Being able to automate and orchestrate security responses across all silos to mitigate threats is essential. Having a forensic history of how the network was secured will aid in understanding how to secure the business against the evolution of sophisticated attacks. Network automation and orchestration will help transform your organization and are the necessary steps to take before newer technologies like machine learning and artificial intelligence can be implemented. To explore the advantages of employing automation and orchestration into your organization and learn more about Workflow Composer, please view our product page.